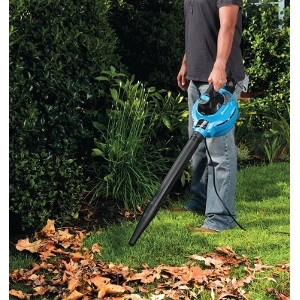 With this convenient 2-in-1 tool, you get a powerful 4 peak HP wet/dry vac that converts to a 190 MPH leaf blower with an effortless press of a button. No more hassling with cumbersome latches and locks. The vac has a rugged 8-gallon polypropylene tank, onboard accessory storage, an extra large drain for quick disposal and a 7' x 1-1/4" secure fit hose. It also features a 10' cord with cord wrap and a large dust sealed switch. It includes a cartridge filter, 2 extension wands, 2-1/2" blower wand, blower nozzle, blower adaptor, floor brush/squeegee, and a crevice tool.